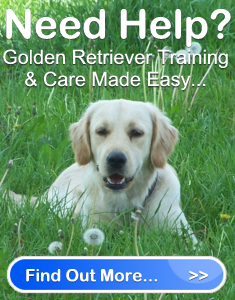 Golden Retriever Puppy Information And Advice | Golden Retriever Savvy " "
A Golden Retriever puppy is a cute little ball of fluff, and you won’t want to wait to take him home. But is your home ready for a puppy? Have you removed all possible hazards that could potentially injure or seriously harm your new pup? Before you bring your Golden Retriever Puppy home, you need to make sure that he will have a safe welcoming. You can ensure this by following these few important steps. 1. Hide the house hold cleaners – you likely have cleaners such as laundry detergent, soap, dryer sheets, bleach, etc. Make sure that all of these cleaners are in tightly sealed containers, and are stored out of your Golden’s reach. If your puppy came in contact with cleaners they can be burned if splashed or the cleaner is ingested. 2. Keep chemicals in a safe place – The chemicals that pose the highest risk to dogs are automotive fluids (particularly antifreeze), weed killer, fertilizers, bug killer, over cleaners, etc. If your Golden Retriever puppy happened to consume any of these chemicals he could become severely sick. Keep chemicals stored in locked cupboards. If they are in your garage, make sure your Golden is never left unsupervised. 3. Keep food covers out of reach – Anything you use to cover food, such as foil wrap, plastic wrap, etc. have food on them. If you have discarded any of these items, make sure they are secure in your garbage. You don’t want your puppy ingesting any of these items as he could choke on them, or they could become lodged in his digestive track. 4. Lock up those Meds – Don’t leave out any medication, including your dog’s medication. Keep all mediations in a bathroom medicine cabinet, where your dog won’t be able to reach. Note: If your dog is ill, you should never self medicate him. Take him to the Vet to receive proper diagnosis and treatment. 5. Food Allergies – Your dog may have a food allergy that you are unaware of. For instance, many dogs are highly allergic to chocolate. Therefore, while you will be tempted to give your Golden Retriever puppy some of your food, don’t give into their pleading eyes. Feed them their regular dog food. If you want to give him scraps or share a little bit of your food with them as a special treat, consult your vet first. In addition, make sure you clear the table of left over food when you are done eating, and don’t leave the garbage bag on the floor (open or closed) as mischievous puppies will do everything they can to get at the food waste. 6. Evil houseplants – Some houseplants, while beautiful and wonderful air purifiers, can actually be harmful to curious dogs who get the munchies. Some house plants can cause dogs to become violently ill. Make sure you research your plants to find out if they are puppy proof. 7. Loose wires – Loose wires may look like a fun toy to your inquisitive Golden Retriever puppy. Unfortunately, this is one toy that can electrocute your dog if he decides to chew it. Keep wires hidden, or off the ground to make them harder to find and less tempting to chew. 8. Sharp objects – Anything that has a sharp edge, such as knives, nails, sewing needles, paper clips, staples, and even broken bits of plastic can cut your dog – or worse – he may swallow them causing harm to his interior. Make sure you clean up any messes and have nothing lying around. As you can see, there are plenty of things that you naturally have in your home, that could harm your new Golden Retriever puppy. To make sure he is safe, keep a close eye on him and take anything out his mouth that isn’t food or a chew toy.